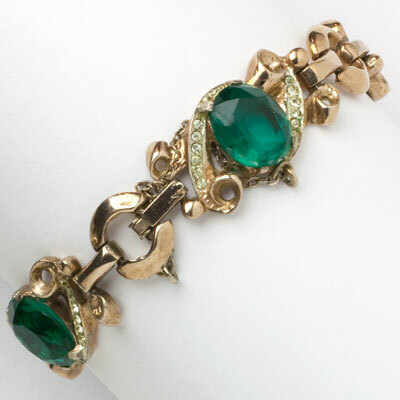 Faceted, oval emerald glass stones set in rose-gold-plated sterling silver and accented with pavé scroll links form this 1940s bracelet. It was designed in the Retro Modern style by Adolph Katz for Coro’s high-end line. This bracelet has a fold-over clasp with safety chain.